Ever daydream about abandoning your current responsibilities and running off to a scenic location to start something new? Maybe you’ve thought about moving away and opening up a resort on a Greek island, like I did after watching Mamma Mia for the first time. Because if you’re living in paradise, surely everything will come easily and the stresses of daily life will fade, right? Bad news for our daydreams, friends. As Jean Christophe Buillet, general manager and owner of luxury boutique hotel A Sunset Chateau can tell you, even if you’re located in a picturesque vacation destination, operating a small business and attracting new customers is not always a peaceful, relaxing process. Jean’s parents and their former business partner purchased A Sunset Chateau about 16 years ago. Located in Sedona, Arizona, the resort is in an absolutely gorgeous location. Breathtaking panoramic views of the surrounding red rocks and resort amenities, such as tennis courts, a saltwater pool and jacuzzi, colorful gardens, and waterfalls, make A Sunset Chateau the perfect place for guests to unwind and relax. Jean himself didn’t set out to run a resort. He worked many different jobs growing up, including as a chef, an insurance salesman, and an IT professional. But when his parents purchased the A Sunset Chateau, he saw it as an opportunity to settle into the hospitality industry. With a variety of skills and experience to pull from, Jean now wears many hats at the resort. Accounting, photography, IT, and marketing all fall under Jean’s domain – and, because he’s running a small business, so does putting out the fires from day-to-day. When I recently spoke with Jean, he was in the process of building (and I mean hand coding!) a new website for A Sunset Chateau. This is a huge project in itself, but Jean has to find time to balance this with the other tasks on his plate all while helping with daily resort operations. Because every week is extremely different and there are only so many hours in the day, Jean is constantly on the lookout for processes and tools that save him time. Even with a beautiful setup, various amenities, and attentive staff, Jean knows that more goes into attracting new customers than just word of mouth, as the resort landscape in Sedona is extremely competitive. Your hotel can offer a five-star experience, but if you aren’t focusing on marketing and spreading the word, even the best resort can turn stagnant. Adding to the unique challenge of marketing in this environment, Sedona doesn’t have the advantage of as many repeat customers as a resort in Napa Valley, for example, due to geography. Though Sedona is a popular vacation destination, it is less accessible than other areas, so repeat guests account for only about 8% of A Sunset Chateau’s business. At first, A Sunset Chateau relied on referral traffic from directory sites such as Sedona.net or bedandbreakfast.com to help find new customers. These websites provided great value and a large portion of bookings. However, as search patterns changed on Google over time, these directory sites started to provide less value. New customers from these sources began to diminish, and recently these referral sources have dwindled down to providing almost no value for the resort. Considering the challenges of marketing hotels in Sedona already, this was a huge problem for Jean and the rest of his team. If we think about how online search habits have evolved over time, though, this phenomenon makes complete sense. Google has really made an effort to be the trusted source for just about everything online. They want to be the first website you visit whether you’re looking to purchase a product, book dinner reservations, or research a hotel for a weekend getaway. Google knows that the average person’s attention span is short – and is only getting shorter! When you search for something like “getaway in Sedona, AZ,” Google aims to give you the best, most efficient experience possible. Naturally, strategies like paid advertisements on the search results page have increased in popularity. Due to the decrease in supply from directory sites, Jean knew he needed to invest in additional marketing activities, like paid search. Jean used the native Google Ads platform in the past, but between trying to find time to navigate the complex interface and learning a completely new discipline with paid search advertising, he realized he needed to work smarter not harder. He sat in on demos for other PPC optimization software, but he noticed that most of these platforms were geared toward large companies with large budgets – leaving much to be desired for small and mid-sized businesses. “They didn’t provide enough of a focus area,” Jean mentioned. He just didn’t feel like these tools were applicable to him. Luckily, Jean attended one of our many webinars and became familiar with WordStream and how it could help him streamline and optimize his Google Ads account. Once he completed a demo of the product, he knew this was the missing key for his paid search efforts. His parents, on the other hand, weren’t so easily convinced. Jean pitched the idea of using WordStream to help manage their paid search account – without much luck for more than a year – before he eventually decided to take matters into his own hands. “I finally just decided to do it myself!” Better to ask for forgiveness than permission, right, Jean? Luckily, Jean’s parents decided not to disown him, and after a few months using the software, it turned out Jean’s intuitions were completely right. He started seeing ROI that justified the price of WordStream – and then some. Who wouldn’t click on this ad?? When he first signed on with WordStream, Jean admits he wasn’t as diligent as he should have been with logging in and auditing his account every week. He kept his account structure mostly the same and was just using the software’s 20-Minute Work Week feature. Though this was still helpful for Jean, he knew he was just scratching the surface of account optimization. Jean soon decided it was time to restructure his account. He had set up his previous account structure in Google Ads before he understood the best way to segment campaigns and ad groups. He went from having one campaign trying to service all segments and audiences and to breaking everything down by sub-category. That way, his accounts were better organized, and he could target the most relevant keywords with the most relevant ads. 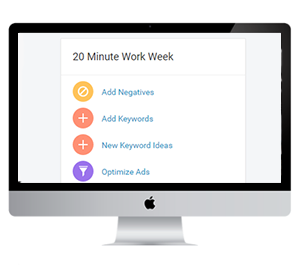 He still uses the 20-Minute Work Week in addition to suggestions from his Customer Success Rep, Lauren Gentile, to edit and adjust certain settings and ads as needed. For Jean, receiving automated suggestions within the software and account recommendations from an actual human familiar with his account is a winning combination. Jean’s story and success using WordStream is one of the most impressive use cases I’ve seen to date. A Sunset Chateau is able to spend 67% less on advertising and has seen revenue increase by 21%. And, paid search is now the #1 source of new business for A Sunset Chateau. Being able to raise revenue and spend less for marketing has had a major impact on the business. In fact, Jean stated that his family was recently able to pay off their hotel loan after 15 years! I’ve got to say, this is the kind of life-changing event WordStream hopes to see with all of our customers. Though the credit completely goes to Jean and his team, I couldn’t help but feel all mushy inside when he told us the impact the software has made for the company. Besides being able to pay off their hotel loan, A Sunset Chateau has also used their cost savings to complete a few renovations throughout the property. They hope to perform an even larger, resort-wide renovation in the near future. WordStream hopes to be there every step of the way to help them achieve this goal. So the next time you’re daydreaming about starting a new adventure, hopefully you’ll think of Jean’s story and know that this type of success is difficult to achieve. However, with years of hard work, the ability to adapt to changing market conditions, and a passion for what you do, success is possible for small and mid-sized businesses. And this is what we’re all about at WordStream.